Diwali is a five day festival, and the days are known by different names in different parts of India, by different communities. Here we present a synopsis of the regional names of Diwali in India, and the different names by which the different days of Diwali are called. It is widely known as Dhanteras, and it is considered auspicious to buy metals on this day. Jewellery houses record maximum sales on this day. It is also known as Dhanatrayodashi, Dhan Teyras, Asweyuja Bahula Thrayodasi, Dhantheran and Yamadeepdaan. Diwali is celebrated on a smaller scale with 5 to 7 diyas lit, and bursting of a few crackers. It is more of an invitation to Diwali. 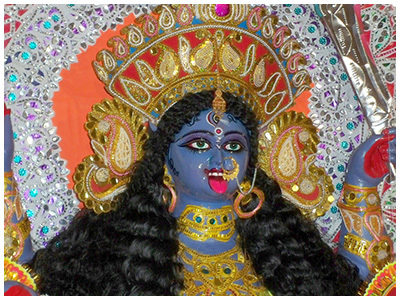 It is known as Choti Diwali, Narakachaturdashi, Roop Chaturdashi, Kali Choudas, Mahanisha or Kali Puja and Divili Panduga. This is the day when Diwali is actually celebrated with all its fanfare, sweets, firecrackers and lighting decorations. It is also known as Laxmi Pujan, Chopda Pujan, Deva Divali, Sukhsuptika, Kaumudi Mahostavam, Badhausar, Balindra Pooja, Karthigai Deepam, Thalai Deepavali, Sharda Pujan, Bandi Chhor Diwas and Diyari. This is the also the day of Hindu New Year. Books of accounts are closed and new ones are opened. Pujas and worships are performed on businesses. Goverdhan puja, Bestavarsh, Gudi Padava, Varsha Pratipada or Pratipad Padwa, Annakoot, Bali Padyam or Bali Pratipada and Muharat Pujan. This day is equilavalent to Rakhi, when sisters wish for happy, safe and long life for their brother with a tika on their brother's forehead. It is knwn as Bhai Phota in bengal, Bhaubeej or Bhav-Bij in Maharastra, Bhai Tika in Nepal, Yamadwitheya or Bhathru Dwithiya, Gorehabba in Karnataka and Bhathru Dwithiya and Bhatri Ditya elsewhere.